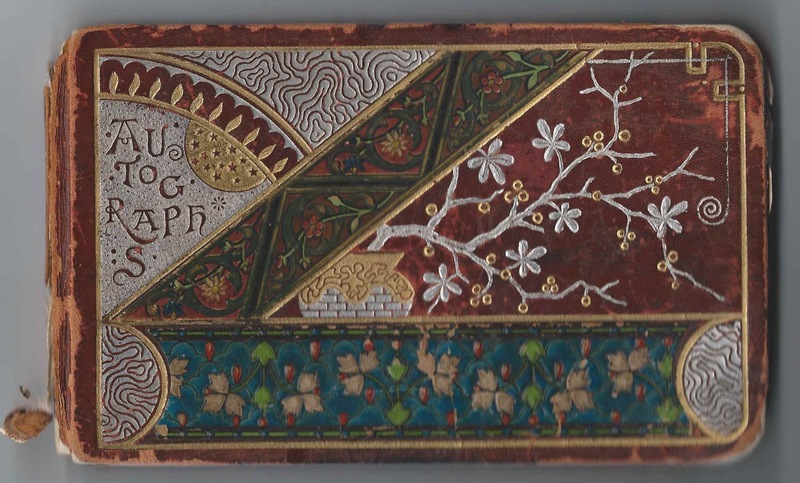 1880s autograph album of Emma McWhinnie of Lincoln, Nebraska, presented to her on her birthday, May 11, 1883, by her mother, Louisa (McWhinnie) McWhinnie. The album is approximately 7" x 4-1/4" and contains the sentiments of nearly 90 of Emma's relatives, schoolmates and friends, some of whom wrote on more than one page. An alphabetical list of the signers appears at the end of this post. 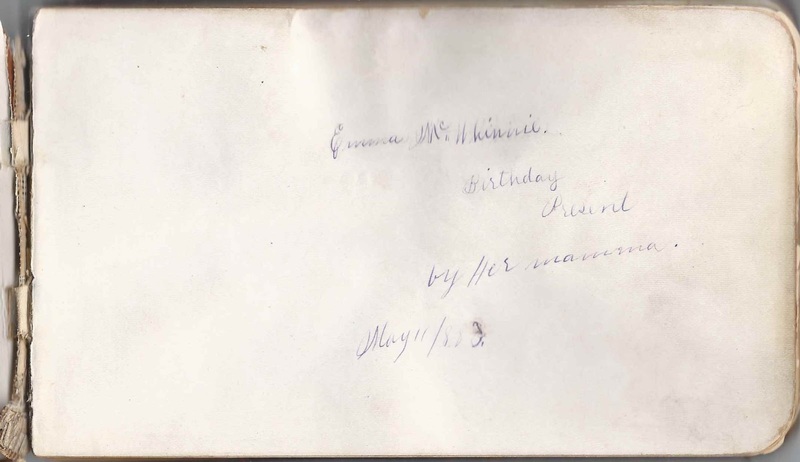 Elizabeth Emma McWhinnie was born 11 May 1874 at Ormstown, Quebec, the daughter of John McWhinnie and Louisa (McWhinnie) McWhinnie. At some point, the family moved to Lincoln, Nebraska, where John was engaged in the clothing business. John McWhinnie was born 27 January 1840 in Scotland. I don't have the names of his parents. Louisa (McWhinnie) McWhinnie was born in Canada, probably in Quebec, the daughter of Michael McWhinnie and Marie Delphine (Dubois) McWhinnie, who were born, I think, in County Down, Ireland, and Valleyfield, Quebec, respectively. Emma's brother William John McWhinnie was also born before the move from Quebec to Nebraska. Her brother, Edward James McWhinnie, and sister, Mary Louise McWhinnie were born in Nebraska. 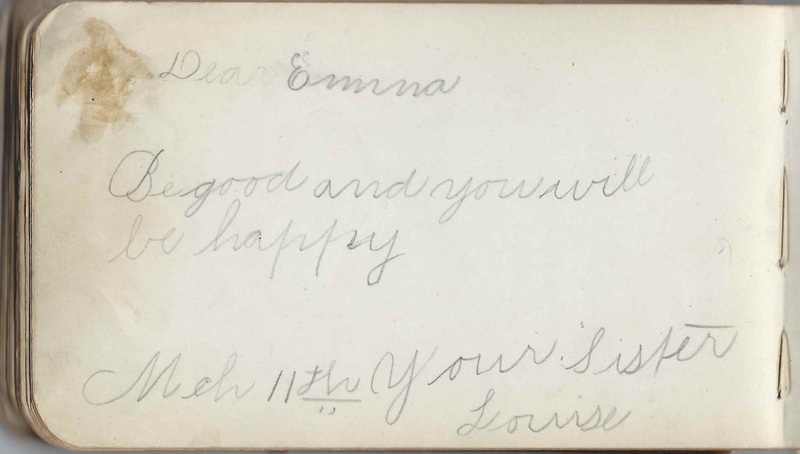 Emma's sister Louise signed a page in the album on March 11, but she didn't mention a year. She also signed a page with three other people: Dottie Stire; Marie Hebbard; and Lena Anderson. 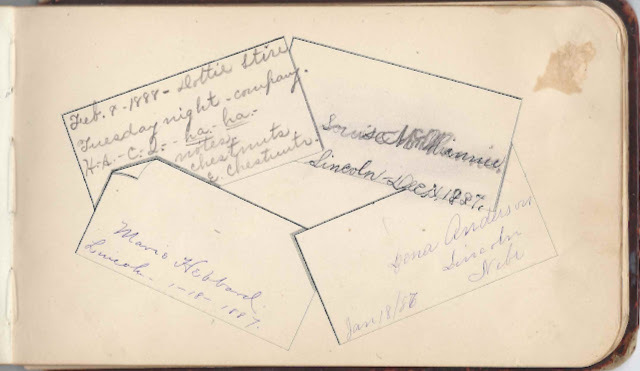 On 30 March 1898 at Lincoln, Nebraska, Elizabeth Emma McWhinnie married William A. Coffin. He was born in Iowa, on 28 June 1871, according his gravestone, shown on Find-a-Grave. The couple had a daughter, Harriet, born about 1901. I'm not sure if there were other children. Harriet married Edmund Blinn Rogers; they had no children. I purchased the album on eBay in 2007; it came with a two page sheet of provenance and family information written by the great grandson of the woman who married Edmund Blinn Rogers after Harriet died. As the new wife was cleaning out the attic, this album came to light, and her great grandson asked if he could have it. William died in 1947, and Emma in 1950; they're buried in the Wyuka Cemetery at Lincoln, Nebraska, along with other McWhinnies, and Harriet and Edmund B. Rogers. If you have corrections to the information above, or additions to it, or information on any of the signers listed below, please leave a comment or contact me directly. Thanks! Harry A., signed at Lincoln, Nebraska, in 1888; "Christmas D.E.G.H. [or D.E.C.H.]" Alfaretta B., signed at Lincoln, Nebraska, on January 14, 1885; shared page with Della J. Alfaretta signed a page at the back of the album as well, as Alpharetta B.B.B.B. Della J., signed at Lincoln, Nebraska, on January 14, 1885; shared page with Alfaretta B.
Marie, signed either at Lincoln, Nebraska, on February 22, 1891, at 1514 P Street or Denver, Colorado, where she was likely living in 1891. Blanche Angel, signed at Illion, Kansas, on July 25, 1887; or Blanche Angel could be her given names. Grant Angell, signed at Ilion, Kansas, on July 25, 1887. He signed his name backwards. Grace Burr, Emma's schoolmate. "My paper poor, My ink is Pale, My Pen came out of a chicken's tale"
Eda Carpender of Lincoln, Nebraska, signed on January 18, 1887; Emma's schoolmate. Byrmina Long, signed at Ilion, Kansas on July 14th [no year written]. She married Gilfred Mock. W. B. McAshan of Lincoln, Nebraska, signed on October 11, 1885; possibly Walter B. McAshan. 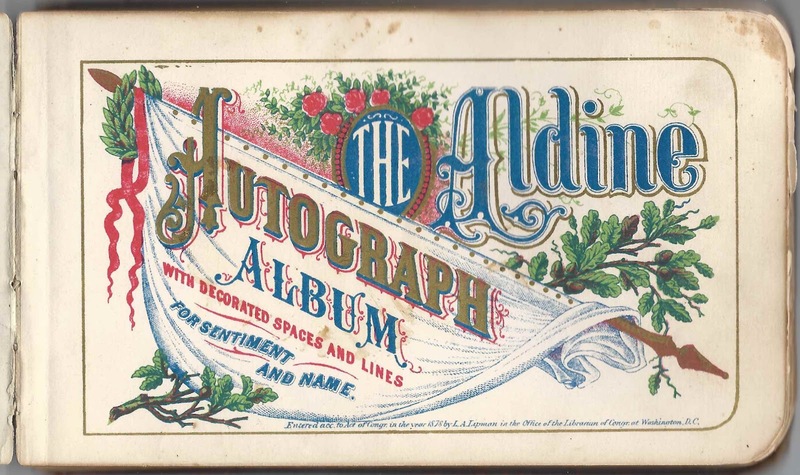 His wife signed a page later on in the album. Mrs. W. B. McAshan of Lincoln, Nebraska, signed on October 11, 1885. Her husband signed a page earlier in the album. Paul Threw, signed on April 24, 1886. His mother and sister, Mrs. J. H. Threw and Virginia Threw, also signed on the page, on different dates. Virginia Threw, signed on April 24, 1886. Her mother and brother, Mrs. J. H. Threw and Paul Threw, also signed on the page, on different dates. Alice A. Wilson, signed at Lincoln, Nebraska, on April 12, 1894. "Halifax, Nova Scotia"